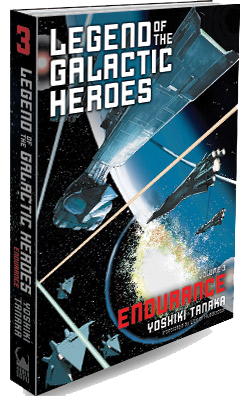 ﻿ Legend of the Galactic Heroes, Volume 3: Endurance « Haikasoru: Space Opera. Dark Fantasy. Hard Science. A grand scheme for retaking Iserlohn is delivered to Reinhard, who with renewed determination seeks to become ruler of the galaxy and fulfill the oath he made with a dear departed friend. But what are the aims of Phezzan, the third force at work behind the scenes? Meanwhile, no sooner is Yang breathing a sigh of relief at Julian’s safe return from his combat mission than Yang is summoned to an inquest and departs for the capital of the alliance. As if waiting for an opportunity to strike, however, the imperial military sends their secret weapon right to the gates of Iserlohn. The battle begins! Who will endure? Operator reports often left Commander Eisendorff feeling unpleasant. Whether the report was delivered with robotic calm or with a hysterical sense of emergency, both styles had a way of scrambling his nerves. So what? he wanted to shout back at them. The solitude of command—that inability to delegate judgments and decisions to anyone else—was making him want to lash out at these people who had no such responsibilities. “Stop reporting every needless detail!” he said, rewarding the operator with not only a shout, but a blow to the back of the head as well. Perhaps the operator too could now be numbered among Julian’s victims. Over on the Alliance Armed Forces’ side, however, Rear Admiral Attenborough was feeling a similar sort of irritation. Although possessed of outstanding qualities as a commander, someone else might indeed be better suited to the challenge of leading this “troop of boy scouts” into battle.